On Tuesday I shared about a personal struggle, and how I became transparent and asked others to help me find healing. You can read: Being Transparent: 3 Ways To Invite Others Into Your Healing here. There are times when we need help healing. There are other times when Jesus is asking you to help someone else. 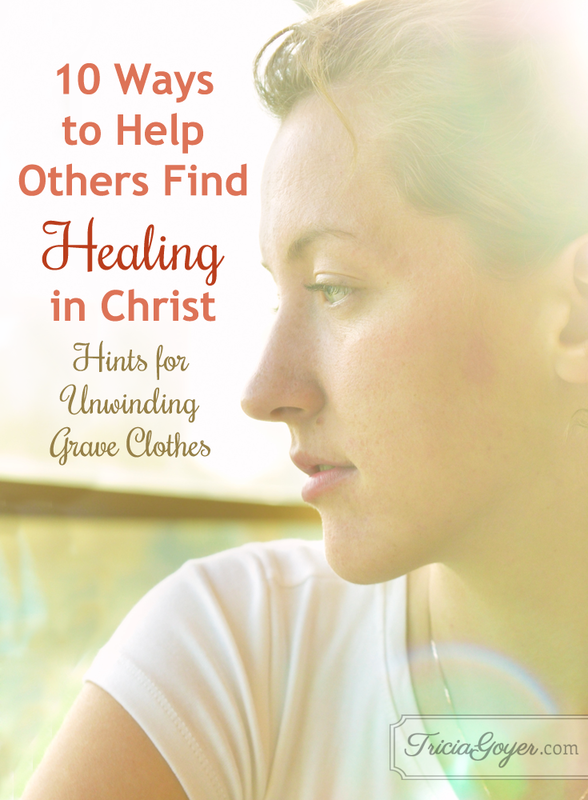 Here are 10 ways to help others find healing in Christ. Be available (Matthew 9:36). Ask for eyes to see what God sees and where He would have you participate in His work. When you recognize a need, ask how He wants you to be involved. Sometimes prayer is our only calling. But when the Holy Spirit prompts you to step forward into the situation, don’t shrink back. Pray specifically about what God is calling you to do (Isaiah 30:21). Whether it involves taking an hour to listen or a significant ongoing investment of time and resources—whatever you feel called to do, do it. But also check your motives. Keep in mind that the work is God’s, and you are simply there to do what He tells you. Listen to the person’s story (Galatians 6:2). Too often we operate out of faulty assumptions. Ask the person to share his or her story, and insert pertinent questions to help the process along. Often it isn’t until we know where people have been that we’re able to help them get where they need to be—and the very act of listening brings healing. At the same time, don’t allow yourself to get swept into an emotional drama and forget to factor in God. Invite Jesus into the interaction (James 5:16). You’ll want to do this with care and sensitivity, as some have been wounded by religious people in the past. (Sadly, it happens.) Look for ways to bring Jesus and His love into the conversation in nonjudgmental ways. Pray together, taking each and every need to Him. Encourage the development of a personal relationship with God, and gently urge the other person to turn to Him first with his or her needs. Ask God for wisdom (Colossians 1:9). Let the Bible be your guide. Don’t counsel solely out of your own experience, opinion, or bias, or you may give tainted advice. Ask the Holy Spirit for a gift of faith to see what the person can become so that you minister out of hope, not despair. Find scriptural promises to pray and declare boldly over the person’s life. Ask the Lord to lead you to helpful resources you can share. Speak the truth in love (Ephesians 4:15). Someone has said, “Love without truth is flattery, but truth without love is cruelty.” Ask God to give you a genuine love for the person. Speak words of affirmation often, pointing out good qualities in his or her life and praising the progress made. But don’t be afraid to gently point out inconsistencies between the person’s life and God’s Word. Do it humbly and gently, knowing that truth sets us free. Make room for others to help (Proverbs 15:22). We are rarely the only ones God uses in people’s lives. God has also appointed certain people—parents, spouses, pastors—to provide both authority and spiritual protection. Honor and support such “coverings” when appropriate. Be willing to decrease so other godly influences can increase. If you sense the other person is becoming overly dependent on you, point it out gently and slowly step back so God can step in. And don’t be offended if your season in someone’s life comes to an end sooner than you think it should. Remember, graveclothes consist of layers (Galatians 6:9–10). Freedom doesn’t come all at once. It is a process of healing you are witnessing, not an event. Don’t give way to cynicism or frustration when it seems to take longer than it should or when one problem is dealt with only to reappear in another form. Encourage yourself and the one you minister to that God will be faithful to finish what He has started. We simply have to cooperate—one layer at a time. Above all, trust God (Hebrews 12:2). Lasting healing is God’s work, and He’s good at it. Trust that the Holy Spirit is working in the heart of the one who needs freedom, and let Him have His way in you as well. Be willing to do what God asks when He asks it, then commit the person to His love and His care. Operate out of faith, not fear. Then watch what God will do! These 10 points is from an excerpt from Joanna Weaver’s book, Lazarus Awakening: Finding Your Place in the Heart of God. Her new companion DVD Bible study that released July 2015. In the teaching sessions filmed in Israel, Joanna explores the halfway life too many have settled for, even as Christians. With the Holy Spirit’s help, we can step out of our tombs and shed the graveclothes that often bind us. But we’re also called to help those around us do the same. Also, I’d love to hear from you: What keeps you from helping other people shed their graveclothes? Also, how has God invited you to be involved in someone else’s healing. I’d love to hear! thank you so much for your post about forgiveness even after having an abortion. I recently made that decision and my heart breaks and longs for my child. I have cried and cried because I thought how could he forgive me. I want so much for Jesus to forgive me and teach me that I can forgive myself. I thank you for letting me know I wasn’t alone in this grief and that there is still hope for my future. I know now that I will never do this again and the next time God blesses me with a beautiful child I will protect it’s life with every fiber in me. Kay, I’m sorry that you had to go through this!! Jesus does forgive you! Also, check out the Bible study Forgiven and Set Free. I’m praying that God will bring complete healing.